Today for the first time, we gave the little guy “Välling” when he went to bed. If you are from Sweden, you know what Välling is, and you probably ate/drank a lot of it when you were a little one. If you are not from Sweden, you have probably never heard of it. So, what is Välling? Imagine you take baby formula and mix it with porridge/cereal. The result is a thicker, denser version of formula, packed with nutrients and density that makes it so a baby will sleep thru the night without becoming hungry. Some parents also give välling to their kids during the day, but we are not planning to do that (plans which of course are flexible 😉 ). whole grain välling made from oats. look at how satisfied that baby is. Many parents start with välling when the baby is 6 months, but we have been back-and-forth about if we should give the little one välling at all. Our logic, which is also backed up by pediatricians and a lot of literature, is if you are feeding the baby enough thru the day, they will not need anything more to get thru the night. My wife is worried about välling because she does not want the little guy to become välling-dependent. It’s hard to get a little one off the välling once they start, apparently. What we have been doing up until this point is giving a bottle when he goes to bed, but he just does not make it all the way until morning. He gets pretty close – maybe 4:00 or sometimes 5:00 in the morning, but we need to get a little further, otherwise he is eating another bottle when he wakes up, and then does not really feel like eating much for breakfast at 7:00, and then the cycle keeps going in such a way every day. 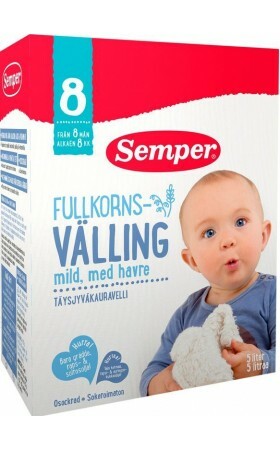 Enter välling, to keep him fuller and satisfied for longer, until it is time for breakfast. The other option would be to keep him up later and give him more food, but then he is not getting the sleep he needs. Not really an awesome option in my opinion. So what about what I said above about “if he eats enough during the day he will not need food in the night”? The thing is, you can’t force a baby to eat, right? So if I want him to eat more thru the day because I know it will generally be good for him and will help him sleep better, and so on, but he says, “no, I don’t want to eat now,” then there’s nothing I can do. And, I should note that he is eating more than the amount of calories that he should have anyway, so it is not that he is under-eating and relying on night meals. But what I think is this: He is growing, developing, and going thru a lot of changes. And we are basically expecting him to go from 19:30-20:00 (when he eats porridge and then goes to bed and has a bottle) until 7:00 (that’s 11-12 hours!) without eating. How many adults do this? Exactly. ← Day 181: Pasta Can be Changed to a Fiber from a Carb? That’s right!